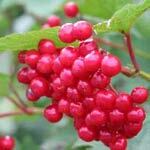 Guelder rose belongs to the same family as elder. In former times it was even called swamp-elder which shows its preference for boggy areas. Many parts of the plant are inedible or poisonous, especially the leaves and the bark. Another name for guelder rose is crampbark, which refers to its use in medicine for treating asthma and heart disease (but don’t try to heal yourself!). Berries are edible when cooked or made into wine, producing a pleasant acid taste. New shoots appear in May. Each leaf has 3-5 lobes. On the top they are smooth and hairy below, similar in appearance to the field maple leaf. The edges of the leaves are toothed. In the autumn, the leaves take on a beautiful wine-red colour. 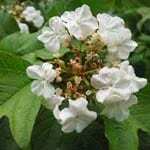 The flowers are white and appear in May and June. The whole flower is a flat head of many flowers. Each single flower stands on a little stem. The single flowers around the outside are bigger than the inside flowers. The bigger flowers are sterile and help to attract insects to pollinate the smaller ones. The fruits are a bright, shiny red and about the size of a pea. They are known as drupes and hang on the shrub until the beginning of winter. Both fruits and flowers are an important source of food for insects and birds. 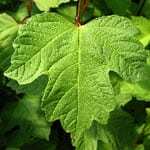 The bark of guelder rose is smooth and green-brown. 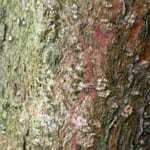 The bark is impermeable to water, which is a protection against rot. 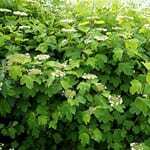 Guelder rose is a shrub – growing quickly up to 2-4m tall. 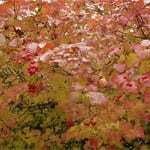 It is often used as a ornamental plant (perhaps because of its bright autumn colours), but normally grows on wet soil – in hedges, wet meadows, river banks and lakes and wet woodlands.